The author was present both during the Dec. 9 deadline mobilization and the Dec. 10 raid, and then filed this report. You can read her live tweets from both days at https://twitter.com/companerajen. After 70 days and 71 nights of encampment at Dewey Square, Occupy Boston – the longest-running encampment in the U.S. Occupy Movement – was raided by the police at 5 a.m. on the morning of Dec. 10, leading to the arrest of nearly 50 people, including two legal observers with the National Lawyers Guild. Following the lead of other cities, the Boston police conducted an early morning operation involving hundreds of police officers, several garbage trucks, and at least one bulldozer. A Long Range Acoustic Device was seen on site but was not used. Police forcibly removed many members of the media at the onset of the raid, preventing them from fully documenting all of the arrests. "From pointing lights in photographers’ lenses to targeting the two official #OccupyBoston USTREAM live videographers for removal, officials went to great lengths to block media access," Occupy Boston said in an official statement. In a show of solidarity, dozens of supporters rallied into the night to demand that all those arrested in the raid be released on bail and not held over the weekend. While the arrests were being made, supporters chanted “Who do you protect? !” directed at the police. The raid came after a Dec. 7 decision by a Boston judge to remove the Temporary Restraining Order won by the National Lawyers Guild, which had previously protected the occupation. The removal of the TRO was followed by an eviction order the next morning from Mayor Thomas Menino. On Dec. 8, within hours of the order, hundreds had showed up on site for the General Assembly. Hundreds more continued to pour into the square as the night went on, with the crowd growing to well over 1,000. Demonstrators came from all across Massachusetts and the East Coast – from Maine to Washington, D.C. Students, workers, and labor and community activists led a spirited rally, with hundreds defiantly inside the camp ready to risk arrest while hundreds more rallied in solidarity across the street. 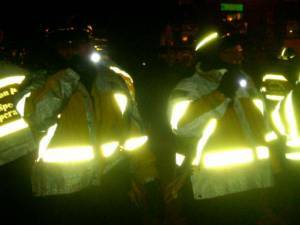 By 1:00 a.m. on Dec. 9, the Boston police announced that no action would be taken, a clear indication of the strength of support received by Occupy Boston. Upon hearing the news, protesters poured into Atlantic Ave. in celebration, chanting "Whose streets, Our streets!" and "We are unstoppable, another world is possible!”, forcing the police to shut the street down. Chants of "This is what democracy looks like" and "Evict us, we'll multiply, Occupy will never die" rang out throughout the night. A large projector projected the slogan "You can't evict an idea" onto a nearby building. Though the raid occurred just over 24 hours after this mobilization, the slogan “You can’t evict an idea whose time has come” remains at the forefront of this new and vibrant movement that will not come to an end because of the raid. A statement from Occupy Boston reads in part: "Boston’s Occupiers will persist in rejecting a world created by and for the 1%. We might have been evicted, but we shall not be moved. We remain invested in the future of our movement. We will continue to challenge Wall Street’s occupation of our government."